In his speech, Ericson Chan shared that Ping An incubated its wholly-owned subsidiary Ping An Technology in 2008, which was dedicated to technology R&D and application. After years of exploration, technology has become an important driving force for the development of Ping An. Ping An technology focuses on the finance, healthcare and smart city areas,and actively practices the corporate philosophy of changing life with technology. In the past decade, Ping An has invested more than RMB 50 billion in R&D, and relying on innovative technologies including artificial intelligence, intelligent cognition, blockchain and Ping An Cloud. Ping An is exploring a new development path of “technology enables finance – technology incubates ecology – ecology feeds finance”. 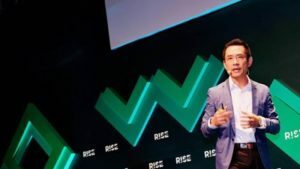 He explained that, in traditional business scenarios, the enterprise only focused on single service and was sales-oriented but with the fusion of AI, blockchain and cloud technologies into traditional industries, the value could be gradually exploited for further application value.For example, Ping An has applied big data and AI technologies to the insurance indsutry survey process whereby the surveyor can arrive at the scene in 5 minutes- which has greatly improved the service efficiency. The sales-oriented service model is changing towards a service-oriented model. Benefitting from the application of a number of cutting-edge technologies, Ping An has formed a huge ecosystem covering 173 million individual customers and 459 million Internet users. Today, Ping An Technology has filed more than 5,000 patents, and there are more than 200 application scenarios for facial recognition technology alone. These technologies are helping build smart cities too. Ping An smart healthcare platform (already featured on innovationhongkong.com), with leading AI technology as its core and Ping An Cloud as its carrier, provides government agencies and medical institutions with a one-stop solution. In smart disease prevention, Ping An Technology has cooperated with Chongqing CDC and Shenzhen Municipal Health and the Family Planning Commission. The accuracy of influenza and HFMD prediction models has reached over 86%, and the prediction accuracy of high incidence season has reached more than 90%. Ericson Chan hopes that one day they can “predict the incidence of influenza like a weather forecast”. “AI+environmental protection” is also emerging. An environmental protection data center platform has been integrated based on global leading technology advantages. Ping An Technology has cooperated with environmental authorities of some cities in China to build environmental data centers, integrate environmental business data, realize unified planning of environmental protection information, and use big data and AI technologies to intelligently process and analyze the environment. A new era is about to begin. How will the technological revolution and industry change redefine the world? “There will be opportunities and challenges”,he said. “There will be a fusion of strategy and technology”.